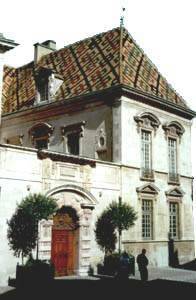 One of the finest of these houses to be built after the Wars of Religion was one of the first -the Hotel de Vogue in the rue de la Chouette, close to the apse of Notre-Dame. Etienne Bouhier, conseiller de parlement from 1607 to 1635, was certainly the builder and allegedly the designer of this miniature palace. If this was the work of an inspired amateur, it was an amateur inspired by a passion for the minutest details of Renaissance decoration. But it is difficult to believe that the inner face of the entrance screen is the creation of an amateur. The visitor who penetrates the courtyard passes through a triple arched screen which presents towards the house a tour de force of Renaissance architecture. The three arches are contained within a Corinthian order. 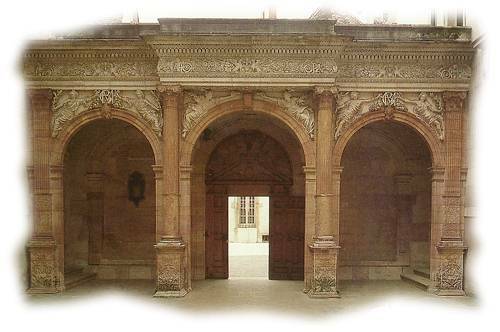 The central arch, slightly larger than those who flank it, forms the entrance and breaks forward enough to permit the use of free-standing columns ; those to either side are flat pilasters. The frieze and cornice are of an intricacy of design which is only equalled by the precision of its execution. In both the side arches the spandrels are filled with figures of women who act as side-supporters to the monogram of Etienne Bouhier and his two wives - EBMG : Bouhier, Massol and Giroux.